To conclude the CSS Intermediate Tutorials section, we bring all we have learnt together in a web page utilizing the knowledge we have gathered so far. 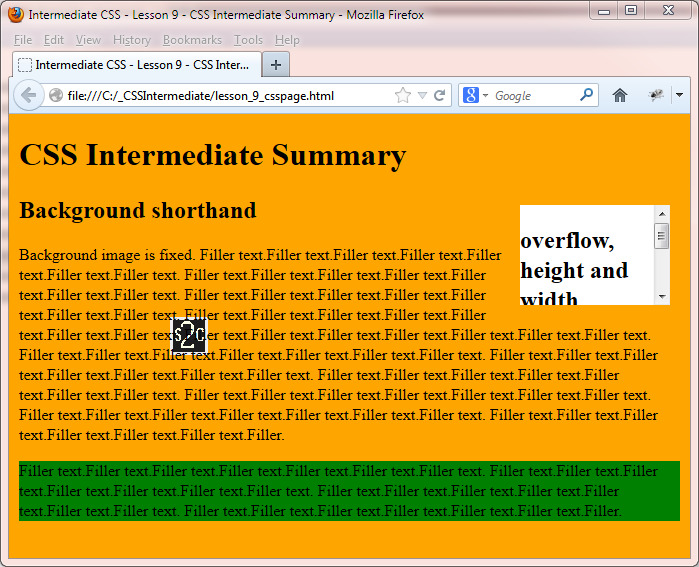 We will use a selection of the properties from the CSS intermediate section and see what can be achieved with them. Lets combine the CSS properties used in this section and see what effects we can accomplish. Open up the file with Notepad we created and tested in Lesson 8: Display. Copy and paste the following code into the reopened file, overwriting the existing text. <p id="para1">Background image is fixed. Filler text.Filler text.Filler text.Filler text.Filler text.Filler text.Filler text. <p>Filler text.Filler text.Filler text.Filler text.Filler text.Filler text.Filler text. Save the file in the C:\_CSSIntermediate folder as lesson_9_csspage.html and close the Notepad. From the C:\_CSSIntermediate folder, double click on the saved file and it will appear in your default web browser and look something like the following image. The background CSS properties add colour and images to our canvasses and really liven up the look of a web page. A good understanding of the box model and how it effects the position of elements on our pages is key to getting the layouts and placement we want. Style inheritance allows our styling to filter through to descendant selectors and thus cuts down the amount of CSS we have to write. By using specificity we can fine tune our elements so only certain elements get styled. Position and display properties give us the opportunity to place elements where we want, even outside normal control flow. The CSS properties presented in this intermediate section add another layer of detail to those already learnt in the basics section. Take some time to get to grips with them and modify the file and see what improvements you can make to the visual representation depicted above. We take our final look at CSS with some more advanced features in the advanced tutorials section. All the CSS 1/2 lessons are listed below. Click a link to go to that lesson.